I am looking to get some venison made into hotdogs, sausages, etc. Any recommendations on places to take meat to have these made? I live just south of Syracuse but would travel, within reason, to have good product. Elite Option 7 72lbs @ 31” draw. Smoothest, quietest bow I’ve shot. Arrows are 425+ grains, and it shoots right at 300 fps. I can’t see myself getting rid of this bow anytime soon. I've never seen what you are describing, sorry. I don't leave divers on my rods. I wind leaders around empty line spools. Floor drains in the basement are just as likely to be tied into septic system, especially in fairly newer homes that are mostly above grade such as this. There is no problem with installing them this way. I can tell you that I have a floor drain in my basement laundry/half bath, and had my septic tank back up on thanksgiving weekend, and I am more than glad I have that drain. Instead of backing up into the toilet and sink in the basement and spilling all over an undrained floor, it backed up the drain, up onto floor level into a 3-4' circular puddle around the drain. Once I stopped all water use it slowly drained out, I mopped the floor and had the tank serviced with very minimal mess with what can be a very messy situation. 6pt- 1-1/2: pencil thin & sleek body, legs are very long campared to depth of body. 8pt- 2-1/2: a little definition in shoulders and rear end, legs only slightly longer than the depth of body. IMHO They will only get better for next year!! So I got this years buck back from my friend tonight along with my brother in law's and another friend's bucks. Mine is the 8 on the left, I do not have him whiten mine as I like the natural bone color, my buddies 6 pt in the middle is whitened though for comparison. 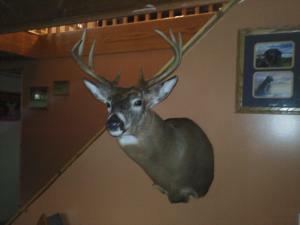 Here is my buck from last year that he did also. As I said before he is always for more to do, let me know and I can get you in touch with him. First day this year in the stand, moved at noon from a funnel b/w two blocks of hardwoods to a pond edge with thick conifer bedding on both sides due to the temps in the 60's and shifting wind. He came through by himself at 4pm. Salmon river. Help a newbie. So I decided to hit the the woods before the lake effect hit yesterday morning. I found at least 10 sheds and got pictures of a few of them, but I think I have a different species of shed antler in my woods. They will not stay still long enough for me to pick them up!!!! 7J - about 900 acres 7 hunters: Me: 1 buck 1 doe 3 bucks by 3 others average buck take, below avg doe take(should be much more).